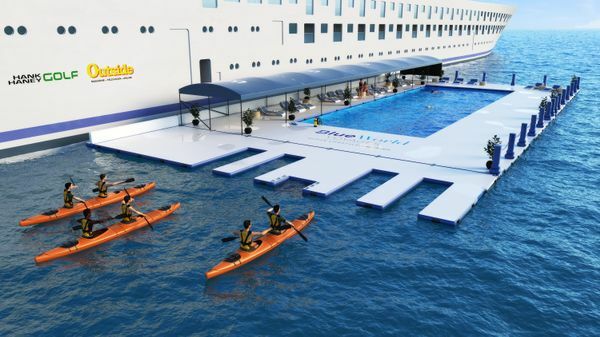 This year, Blue World Voyages will launch the world’s first sports and wellness holiday on water, a new cruise concept completely dedicated to those with active healthy lifestyles. Out with all you can eat buffets and slot machines, and in with two full decks fitted with the highest technology fitness equipment and spa facilities, and décor to match the level of luxury expected of a five-star hotel. To introduce this bold new concept, Blue World Voyages is offering European travellers the chance to win a cruise for two on the inaugural 2019 voyage by signing up to www.blueworldvoyages.co.uk. Itineraries will kick off with a seven-day sailing throughout the Mediterranean, to include destinations such as Italy, Greece, Spain, France, Portugal, Corsica, and Croatia. As a smaller, more intimate vessel carrying only 350 passengers, Blue World Voyages will take you to places that larger floating hotels can’t, getting you closer to unspoiled reefs, hidden waterfalls, and the kind of hiking and biking you just won’t find near jumbo sized ports of call. Whilst onboard, you will be provided with the latest, highest-quality equipment and supervision needed to achieve your ultimate adventure: whether you want to snorkel, scuba, surf, kayak, paddle board, bike, hike, golf, you can indulge in all your wildest sporting dreams. Those looking for a bit of R&R after a morning hike ashore can enjoy the onboard, full-featured luxury spa—the largest (per passenger) afloat to date. Here, guests can enjoy a full spectrum of restorative pampering therapies, from deep tissue massages to revitalising facials. Onboard therapists will cater to your every need using the finest industry appraised spa products. While onboard, the Blue World team will keep dining options wholesome and delicious, while ensuring to maintain the focus on good health at all times. Unlike other cruise lines, Blue World’s chefs will seek out the best local, fresh ingredients in each port, offering guests farm-to-table and sea-to-table menu choices across four speciality dining venues, at no extra cost. If you are passionate about fitness and wellbeing, and are looking for a new and exciting way to see the world on water, be sure to put Blue World Voyages at the top of your bucket list for 2019.